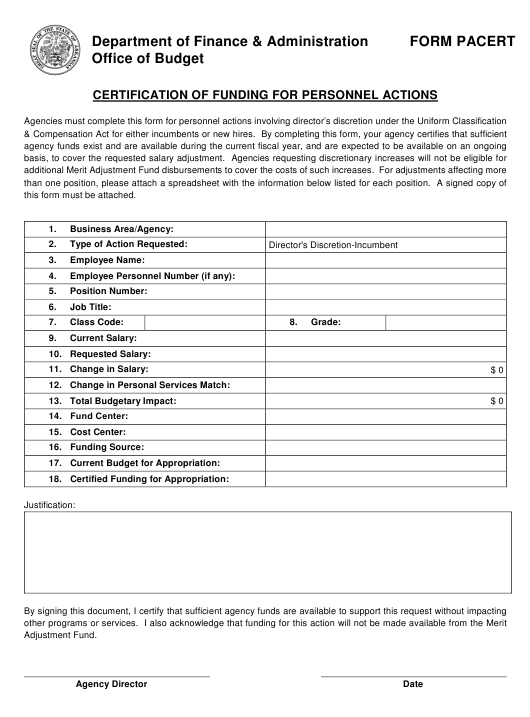 Form PACERT is a Arkansas Department of Finance & Administration - issued form also known as the "Certification Of Funding For Personnel Actions". A PDF of the latest Form PACERT can be downloaded below or found on the Arkansas Department of Finance & Administration Forms and Publications website. this form must be attached. Business Area/Agency—Enter your business area and agency name. Discretion, Growth Pool, Surrender Pool, and Temporary Transition Pool. Employee Name – This box will only be completed for 10% Director’s Discretion or 15% EWQ requests. Position Number—Enter the position number that is the subject of the request. is crossgraded, enter the crossgraded title. Class Code – This is the Class Code associated with the Job Title listed in #6. Grade – This is the grade assigned to the Class Code and Job Title listed in #s 6 & 7. Current Salary – This is the current salary of the position without the requested change. position would not have been accounted for in the current budget. 10. Requested Salary—Enter the salary requested. one position, enter the cumulative entry salaries. the salary of the 1 new position is less than the sum of the surrendered positions’ salaries. also need to be added. increased cost projected that the agency would have to be able to support with current funding. 14. Fund Center – This is the fund center of the appropriation where the requested position is funded from. 15. Cost Center – This is the cost center that the position is paid from within the Fund Center in #11. 16. Funding Source – This is the type of revenue used to support the appropriation from #s 11 & 12.
above. Be sure to include any budgeted pay plan amount as that is not reflected in AASIS. funding source than the requested new position.